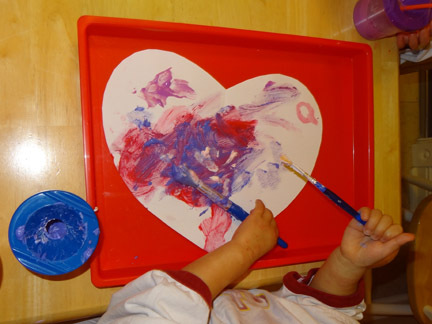 Today I’ve got a fantastic Valentine themed activity for your little ones to try. 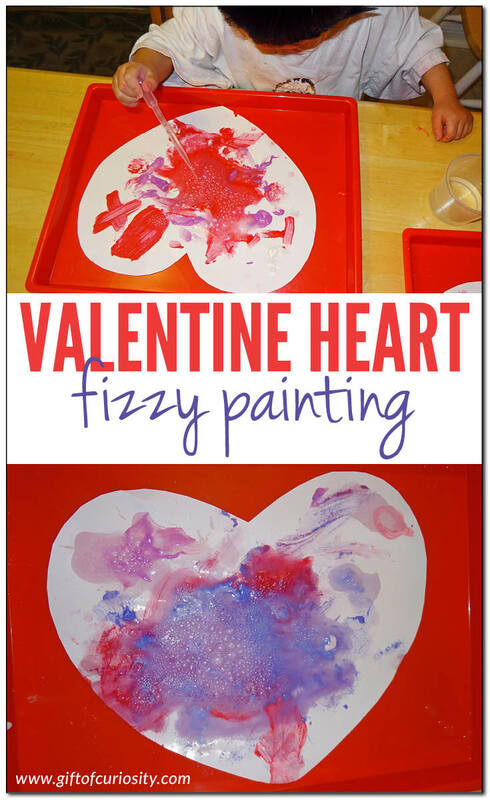 This Valentine Heart fizzy painting activity combines art and science for lots of fun and creativity. 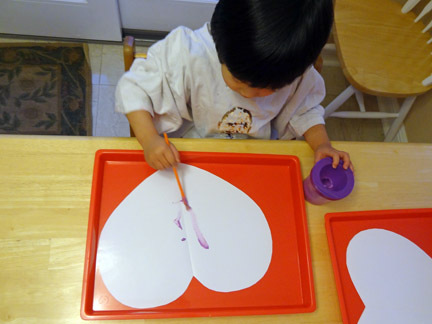 This activity was inspired by a post at Toddler Approved, where they used baking soda and vinegar to make a fizzy pumpkin project. 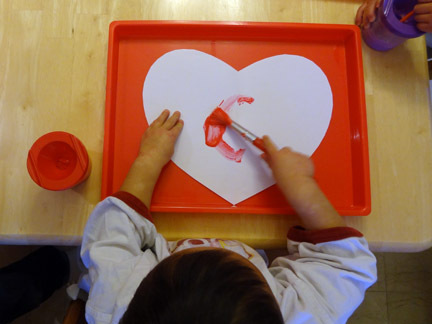 We decided to use the same concept to make fizzy Valentine’s hearts! 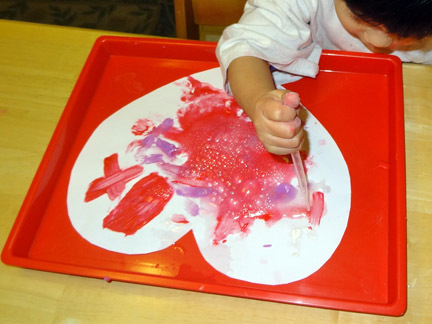 To do this activity, I had to prepare the fizzy paint. I decided to stick with just four, Valentine’s-inspired paint colors: red, purple, blue, and white. 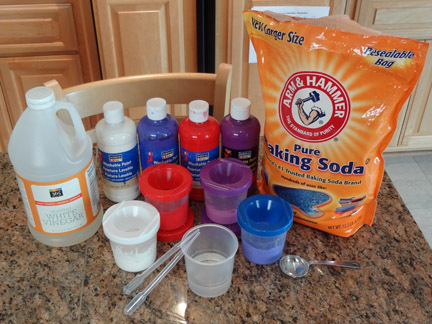 For each color, I mixed 1 TBS of paint with 3 TBS of baking soda in our no-spill paint cups . 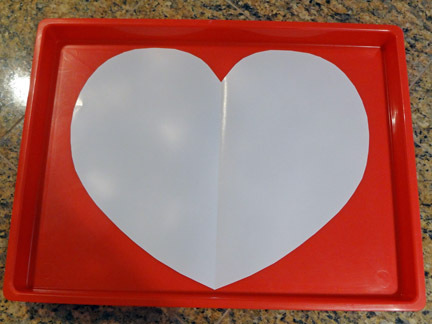 I also prepared a craft tray with a paper heart for each kid. 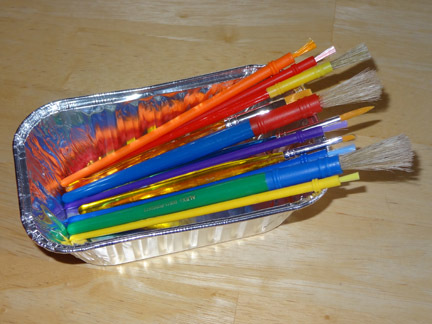 And QBoy and XGirl had plenty of painting brushes to choose from. 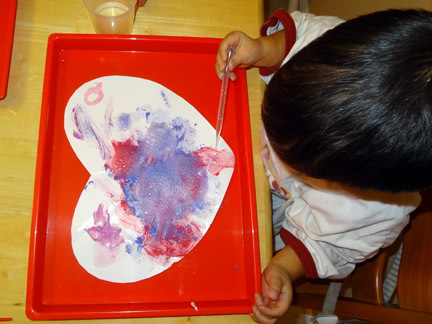 Initially, QBoy and XGirl just thought it was a painting activity, and they happily began applying color to their Valentine’s hearts. 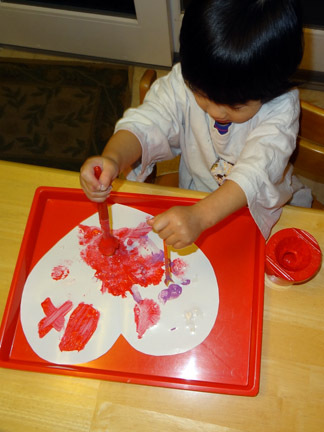 After a while of normal painting, both kids decided to try painting with two brushes at a time. Once they had done plenty of painting, I brought out the vinegar and pipettes. 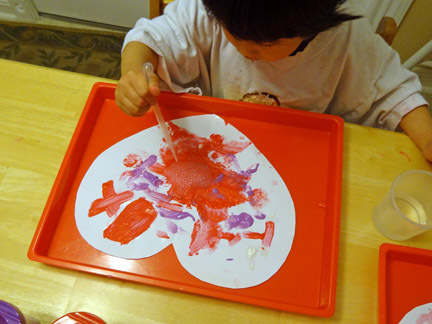 Since we had used the pipettes before, the kids knew how to use them, but they were not expecting the paint to start bubbling and fizzing. 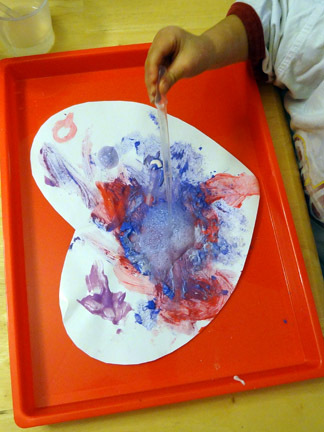 The oohed and ahhed to watch the reaction between the baking soda in the paint and the vinegar in their pipettes. They kept adding more and more vinegar in order to make their paint fizzle again and again. This looks like so much fun! What kind of paper did you use for the heart? Is it just regular paper? I used a special painting paper with a glossy surface, but I I imagine it would still work on regular paper too. Cool! We love fizzy “science!! !” at our house, so my kiddo might go for this. What a fun surprise to add to a painting project! We’ll have to give this a try. These are so neat! New follower from homeschooling on the cheap linky! Love this for valentine’s day! Thanks for linking up at Family Fun Friday. What a cool idea! I need to do this with my girls. They would have a blast! Thanks for sharing on We Made That! What a great idea and wonderful surprise for the kids! I will be doing this soon with my daughter! Thanks for sharing!! I hope your daughter enjoys it as much as my kids did! I was actually surprised at how normal the paint felt. It was a bit thick but not as gritty as I expected. Love this! What a fun surprise for your children. Thank you for linking up this week to the Hearts for Home Blog Hop! Sorry I missed this for Valentines, but will have my class do this with shades of green for shamrocks for St. Patricks. Combo of art and science…thanks. We might end up doing the same thing! I love how you mixed art and science together! How much fun! Thank you for sharing at the After School Link Up! This looks like so much fun! I am featuring it in tomorrow’s Hands-On Play Party! Thanks for linking up! I love this, but am I doing the ingredients correctly? 1 tablespoon of paint and 3 tablespoons of baking powder???? I can’t get the paint to soak in all that powder??? Yep, that’s the ratio we used. But if the paint isn’t soaking in, just add more paint, maybe in a 1:2 ratio instead of a 1:3 ratio. You will still get a fizzy effect even if you change it up a bit! Eventually, yes, it should. But how long that takes will depend in part on how much vinegar the kids put on (and how warm your climate is).